The fantastic Mitsubishi Outlander has a beautifully crafted exterior, married with truly stunning features. Each model has been fitted with impressive 18 inch alloy or 16 inch steel wheels -depending on specification- which gives the vehicle a forceful presence on the roads. A trademark feature of the vehicle is the imposing front grille which makes the model instantly recognisable, even from a distance. The LED daytime running lights extend out on either side of the grille and stretch fiercely round the front end. Models are slickly furnished with Electric mirrors, Fog lighting, Automatic Light Sensors in correspondence with the headlamps and an impressive colour keyed Rear spoiler with silver Roof Rails. The interior has been crafted with a host of technical additions to make driving more enjoyable. The Keyless Operating System (GX3, GX4) provides easier access by allowing drivers to open and lock doors without taking the key out from their pocket. The Dual Zone Climate Control System intelligently offers the driver and passengers separate air conditioning controls, from each side of the vehicle. The resourceful Mitsubishi has an adaptive Cruise Control feature which provides a more relaxed driving experience during longer journeys by allowing drivers to remove their feet from the pedals. This feature is instantly cancelled when pressure is applied to the clutch or brake pedal. Mitsubishi regard safety as being a priority and have equipped this model with a host of impressive features to make sure all those on-board are incredibly safe. The ABS (Anti-Lock Brake System) prevents the back wheels from locking up when braking harshly at high speeds or on slippery surfaces. Drivers can relax knowing that the Active Stability Control operates engine output and automatically applies the brakes to correct any unstable movements and by using similar functions the Traction Control System can prevent drivers from losing control of the car on slick surfaces. The Mitsubishi Outlander additionally features an advanced suspension which offers drivers impressive handling coupled with a comfortable ride. The vehicle has a Speed Limiter to ensure drivers don’t exceed the speed limits and an Emergency Stop Signal System, which reduces the chance of a rear end collision by automatically flashing hazard lights and applying the brakes. The Hill Start Assist aids drivers when they are trying to manoeuvre on steep gradients. 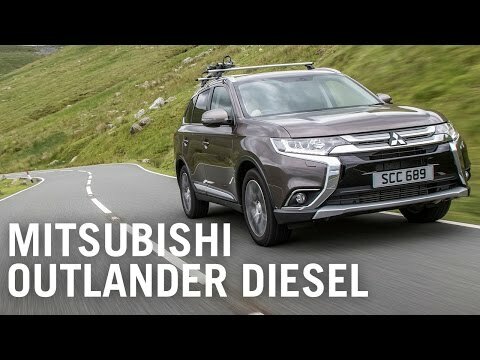 The Mitsubishi Outlander possesses an incredibly efficient DI-D engine which offers remarkable fuel economy and impressive low CO2 emissions. The engine is exceptionally clean and although cost effective, it still boasts a superior performance. The 147 bhp diesel engine only produces 140g/km of CO2 and operates a six speed manual transmission. The model is fitted with Auto Stop & Go technology and an Eco driving mode which collectively prevents the vehicle from using more fuel than necessary. Economy is an important part of the vehicles design and the Gear Shift indicator notifies the driver of the most efficient times to change gears.The intelligent shifter system adapts to the driving style of whoever is behind the wheel and provides visual alerts to the driver. This model features three operable AWC (All Wheel Drive Controls) selections, which offer an electronically controlled, four wheel drive system. The 4WD ECO mode is the best option for fuel efficiency. Alternatively the 4WD AUTO system fully engages the 4WD system and is useful in towing situations. Lastly the 4WD LOCK provides ultimate grip during challenging off road encounters. Drivers and passengers can stay connected and entertained with the USB connection located in the centre floor console storage box which allows those on-board to connect their iPod,MP3 or USB stick, so they can listen to whatever music they like whilst on the go. All models now come fitted with a 4.2 inch colour LCD screen that is conveniently placed between the main dials. This interface is responsible for illustrating relative system controls and connecting devices.